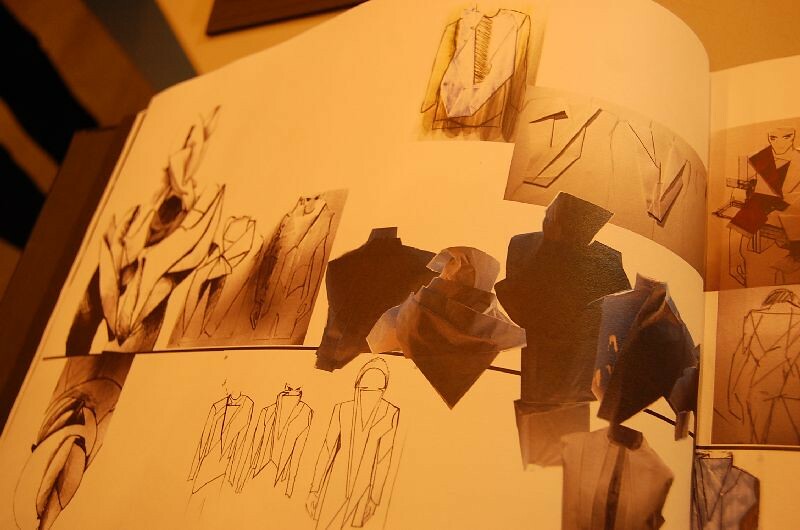 Each June Graduate Fashion Week stages a static exhibition showcasing the work of some fifty universities across fifty two courses, and approximately twenty two University fashion shows. Last week saw me venture back and forth to Earls Court 2 as I took my seat to watch what the current crop of talented BA students showcased. I was fortunate enough to see a number of shows but one in particularly sticks in my memory, Ravensbourne. 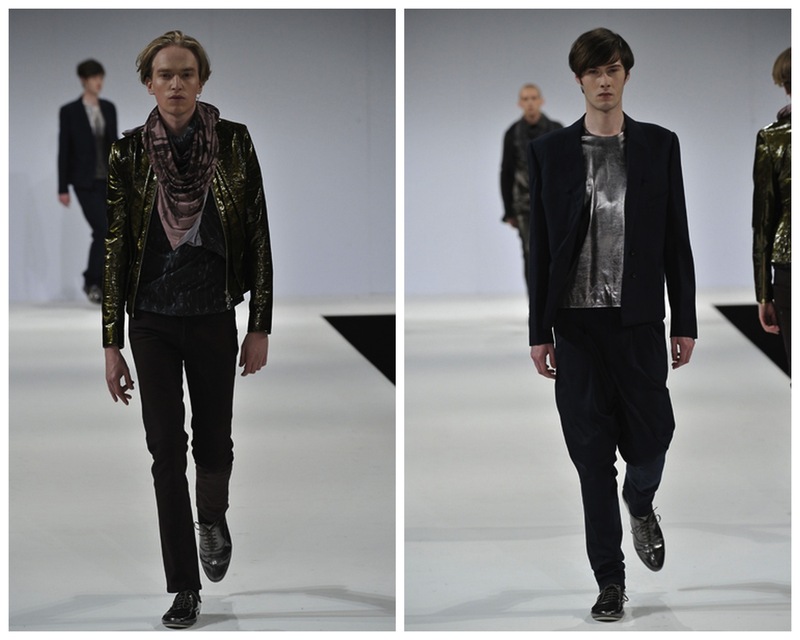 Ravensbourne’s was a graduate collection of beautifully tailored menswear. The womenswear ranged from elegant and bold knitwear to eclectic designs incorporating Swarovski crystals, horse hair and boxing gloves, and exciting textiles creating utilising Ravensbourne’s digital print. It was however the menswear that made me sit up and take notice with stunning collections from Thomas Crisp, Jade Rozenbroek and Bobby Abley. 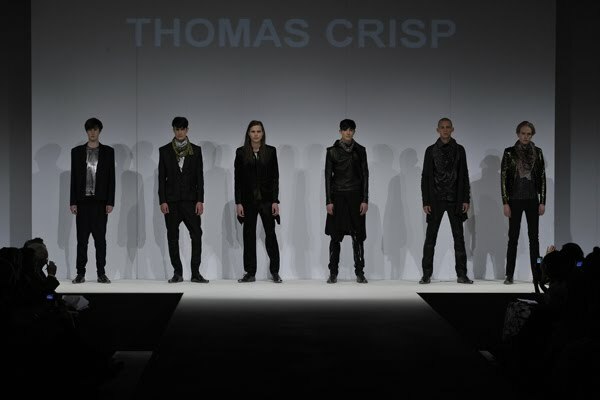 Thomas Crisp's award winning collection. Image from catwalking.com. SS: Congratulations Tom! How does it feel having been awarded this years coveted Menswear prize at GFW? Thomas Crisp: Very Surreal. I can’t quite believe it but I’m very happy. Thomas Crisp: That's tricky, I don't think there was a particular moment it was a gradual process. Until the last term in foundation when I was told to do fashion I had never even thought about doing it. I think being a man I always thought it would be really interesting to design clothes for myself. 4 years ago when I first started thinking about menswear it wasn’t so prevalent as it is today and it felt more like an adventure where you could experiment a lot more. So when I got to choose my pathway mid way through year 1 I chose menswear. A look inside Thomas's sketchbook. SS: Over the last few years Ravensbourne has built something of a reputation for strong contemporary menswear. What was it that attracted you to the course? Thomas Crisp: Thanks, Ravensbourne is very proud of its menswear course. I did my foundation at Ravensbourne and I liked and knew the college. It has a world renowned reputation for producing highly talented and employable graduates and I liked the freedom the course offered. 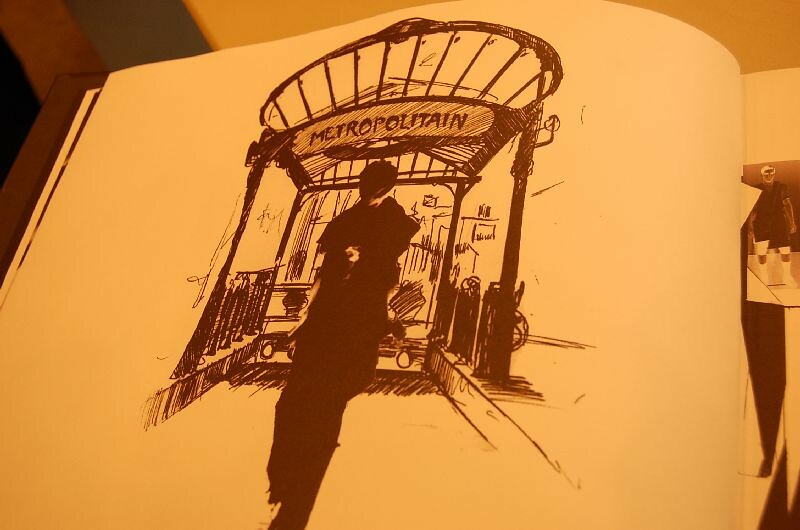 Thomas' reimagined vision of Paris' Gilded Youth. SS: Can you talk us through the inspiration for the collection? Thomas Crisp: The starting point was the Dalek and Delta exhibition. They are two of my favorite graffiti artists who have elevated their work to beautiful and alluring pieces. That mood of something quite street elevated to beautiful paintings and sculptures was really captivating. I really tried to capture that spirit. I then found the title of the collection which is ‘Gilded Youth’ which is a reference to a street gang in Paris in the late 1800’s. However this title and reference came only two months before GFW as it fitted in with the mood and general metallic element direction. I liked their anger, their use of clothing as a political and personal statement of who they were. The Parisian underground element really softened the whole collection. By the end colours, fabrics, designs were all loosely based on the references and it became more about the mood of the inspirations. It was my gut instinct of how I wanted the ‘Tom Crisp Man’ to look like. So in a sense I had to do a whole loop to something I thought about at the beginning of the process. SS: What was your starting point and how did the collection evolve in to what we saw today? 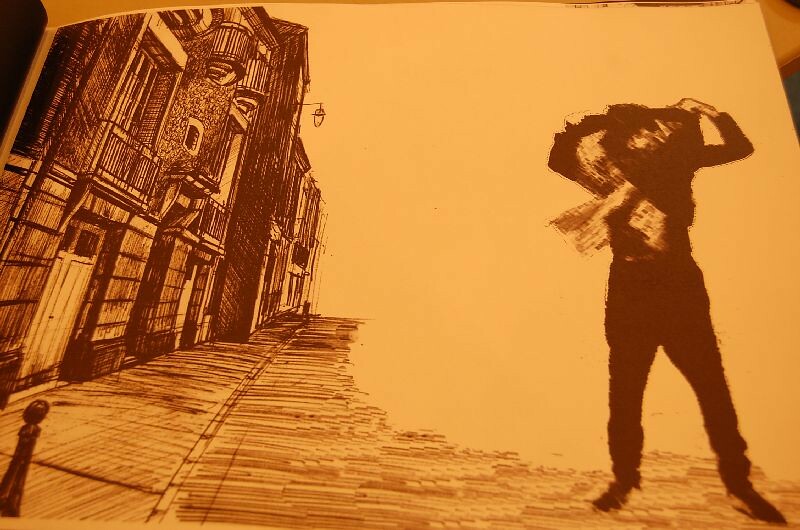 Thomas Crisp: I took inspiration from Daleks use of layers in his work and transformed that into folding paper techniques. These I then warped around the body to create the shapes for the collection. By pre-collection everything was very hard, very angular, all the fabrics were raw-edged and colours included red and purple and teal. After Christmas I concentrated on developing the collection digitally. I created a whole lineup just using digital warping techniques of interesting industrial structures. I then took these and started drawing different variations of each of the pieces, adding in colours and fabrics. However, the collection still felt too hard so I found a reference to the ‘Gilded Youth’ based on the pewter leather that I knew had to be in the collection. 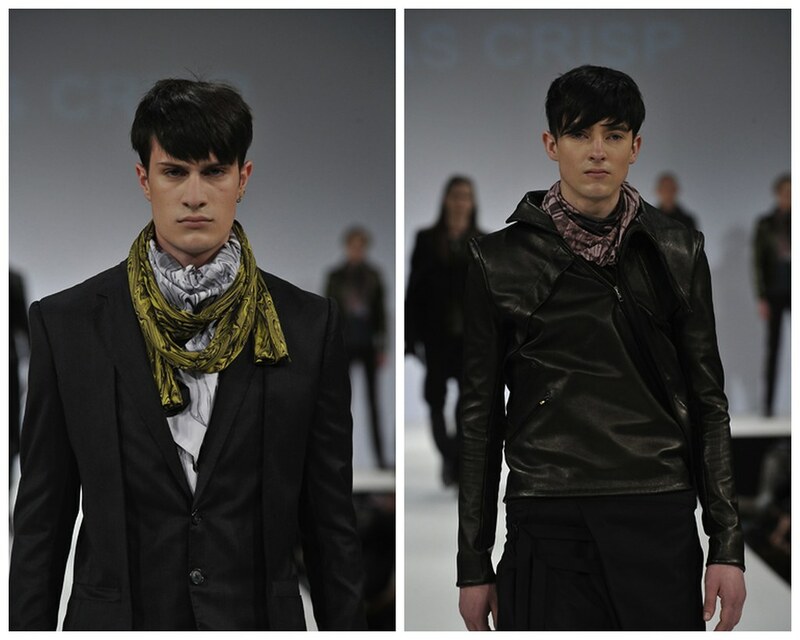 Scarf attachments on shirts appeared through warping and softening the collection. High Edwardian collars came and went in favour of a more stripped back approach in the form of leather T-shirts with digitally printed backs (Something you never got to see on the catwalk). The prints were a bit of a personal indulgence but really highlighted the collection. There were no final drawings of the pieces you saw on the catwalk until after they had been made This was down to knowing the general idea of what I wanted and toiling right up until the point it had to be made. I just based it on what felt right for me at the time. SS: How would you describe the collection in your own words? SS: I know this is difficult question to answer but have you got a favourite, anything that you were most proud of? Thomas Crisp: For me, that’s easy. The green leather jacket. I was very wary of how strong the leather was but it turned out really well. SS: Aside from your own, which graduate collections did you love? Did you have much of a chance to inspect the competition? Thomas Crisp: Well I've just come back from the Royal College show and I loved Robert Huths’ collection but that’s not the graduate collections your asking about! In a nutshell, no I didn’t see much of the other students work, I missed Sunday due to working on my own collection, Monday was our own show, Tuesday was recovering from the day before and Wednesday was the Gala. Though I have to say my fellow finalists, who’s work I enjoyed seeing, all had really strong work. It must have been very tough for the judges. 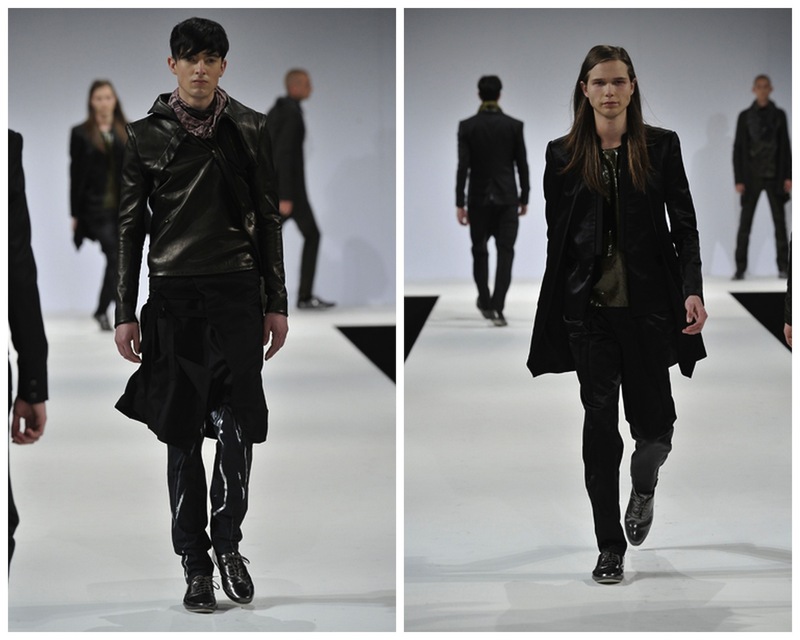 SS: What advice would you give a prospective menswear fashion student? Thomas Crisp: I think the most important thing is to understand men. Who they are, how they dress, why they dress in certain ways and how you can change and tweak those parameters to present something new. Men have to feel right in their clothes, feel comfortable, and at high-end level it has to fit exceedingly well. To any prospective fashion student, be prepared for lots of hard work, frustration and despondency but remember to have fun. Fashion is all about creating excitement. Thomas Crisp: I think to be in Cristobal Balenciaga’s studio and see him working, re-pitching a sleeve for the 11th time because he wasn’t quite happy with the pitch. That’s’ true dedication to perfection. SS: Finally, what would you like to achieve in latter half of 2010 and beyond? 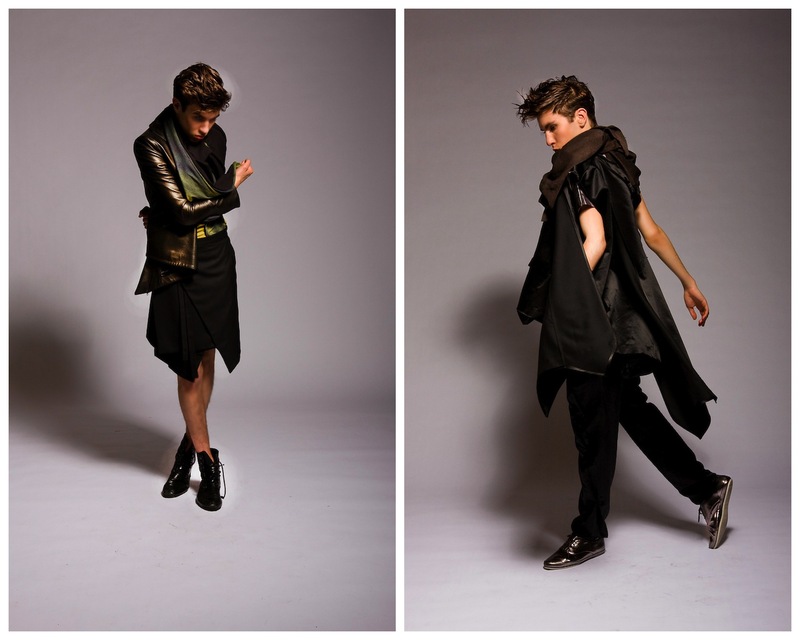 Thomas Crisp: I have a place on the MA menswear course at the Royal College of Art and while there I really want to explore the relationship between science techniques and interpreting them into a fashion context. I also want to explore more with digital print to see how far it can be pushed, and mixing it with performance art and animation. You’ll have to come to the ‘Work in Progress’ exhibition at the Royal College to see how it’s going. 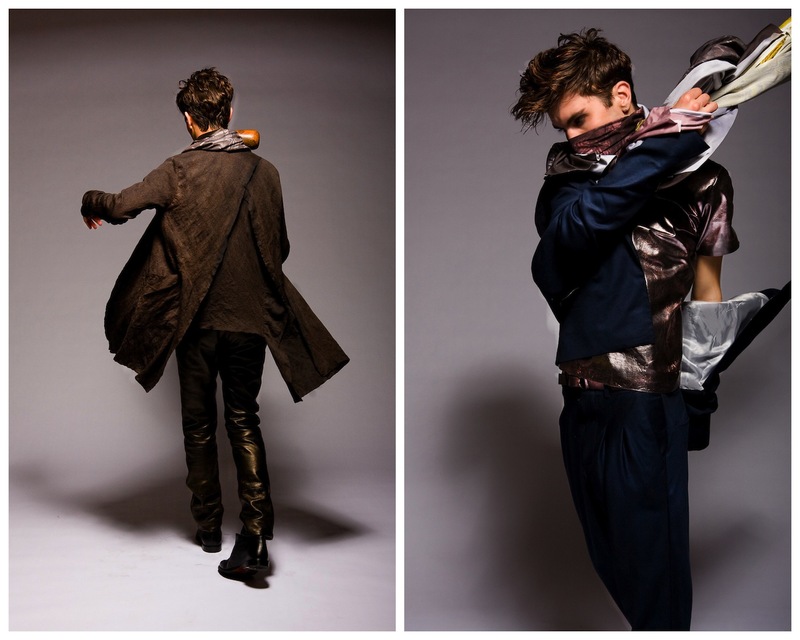 A glimpse at Thomas Crisp's look book. I'm looking forward to keeping my eye on the development of this exciting design prospect. Gorgeous collection, I think Thomas has hit the mark. His masters sounds wonderful. I agree I really think Thomas has got some wonderful designs there. I really love them. Make Do Style: A deserved winner! I'm really looking forward to keeping tabs on Thomas' progress.